PHOENIX (AP) — Arizona Gov. Doug Ducey plans to attend funeral services for former President George H.W. Bush in Washington D.C. The Republican governor's office announced that he will attend Wednesday's state funeral service for the 41st president at the Washington National Cathedral. WASHINGTON (AP) — Former first lady Laura Bush said her tour of the White House Christmas decorations Tuesday made for a "sweet visit" during a somber week. Former President George H.W. 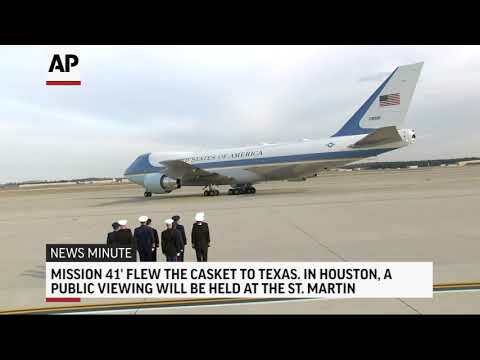 Bush's state funeral encompasses four days of events, from his arrival in Washington to his burial in Texas on Thursday. The guidelines for state funerals date back to the mid-1800s and have been shaped over time. Seating arrangements, for example, are detailed with precision, with the presidential party followed by chiefs of state, arranged alphabetically by the English spelling of their countries. HOUSTON (AP) — Former President George H.W. Bush will be honored during several public and private events in Houston and Washington before his burial Thursday in Texas. President Donald Trump and first lady Melania Trump have paid their respects to former President George H.W. Bush at the U.S. Capitol. 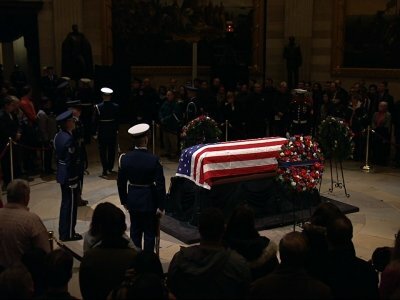 The nation's 41st president is lying in state at the Capitol Rotunda. The Trumps stood in front of the casket Monday evening with their eyes closed for a few moments. The Recording Academy said Monday that because of former President George H.W. Bush's funeral and public viewing this week, it will push back the release of its nominations. It's a busy week for the entertainment world: Nominations for the 2019 Golden Globes come out Thursday. WASHINGTON (AP) — Americans will begin saying goodbye to former President George H.W. 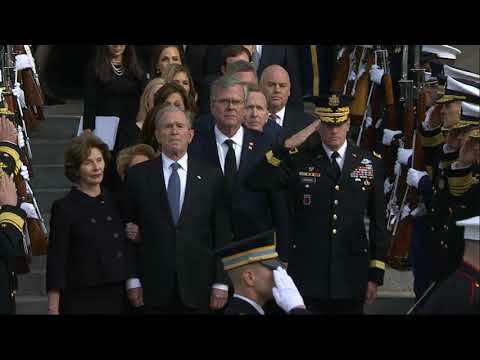 Bush on Monday when his body arrives in Washington for public viewing in the Capitol Rotunda — a rare honor that will be bestowed on a man who earned the respect and admiration of many with his leadership, bravery and grace. BUENOS AIRES, Argentina (AP) — President Donald Trump and first lady Melania Trump on Saturday mourned the passing of former President George H.W. Bush, remembering him as a man of "sound judgment, common sense and unflappable leadership." In a statement issued hours after Bush's death on Friday night, the Trumps said that Bush had "inspired generations of his fellow Americans to public service." Bush, who served as president from 1989 to 1993, was 94. President Donald Trump says he'd be willing to sign a two-week government funding extension to allow for ceremonies honoring the life of former President George H.W. Bush. HANOI, Vietnam (AP) — Vietnam will hold a state funeral and national mourning this week for President Tran Dai Quang, who died last week of a viral illness at age 61. Flags will fly at half-staff and entertainment activities will be canceled during the two-day funeral that starts Wednesday, the Communist Party and government announced. Quang will be buried in his home village in northern Ninh Binh province, some 115 kilometers (72 miles) south of Hanoi on Thursday. ACCRA, Ghana (AP) — United in sorrow, world leaders and international dignitaries came to Ghana to pay their last respects to the late United Nations Secretary-General Kofi Annan who was honored with a state funeral Thursday, as many lauded him as an exceptional man and leader. Annan died on Aug. 18 in Bern, Switzerland at age 80. The grandson of tribal chiefs, he was the first black African to become the U.N. leader and was awarded a Nobel Peace Prize. ACCRA, Ghana (AP) — Ghanaians are paying their respects to former U.N. Secretary-General Kofi Annan ahead of Thursday's state funeral. Annan died in August in Switzerland at age 80. The grandson of tribal chiefs, he was the first black African to become the U.N. leader and was awarded a Nobel Peace Prize. Ghanaians have thronged at a conference center in Accra to remember him. ACCRA, Ghana (AP) — The body of former U.N. Secretary-General Kofi Annan has received a hero's welcome upon landing at Kotoka International Airport in Ghana's capital. President Nana Addo Dankwa Akufo-Addo was with Annan's widow and family members Monday as uniformed soldiers brought Annan's coffin down from the aircraft amid solemn music played by a detachment of Ghana's armed forces. Prayers followed. GENOA, Italy (AP) — With anger and grief, Italians began burying some of their dead Friday from the Genoa highway bridge collapse, holding funerals in the victims' hometowns. Several angry families rebuffed the offer of a state funeral and the cardinal of Naples was merciless in his condemnation of negligence by Italian officials. With anger and grief, Italians began burying some of their dead from the Genoa highway bridge collapse, holding funerals in the victims' hometowns. Several angry families rebuffed the offer of a state funeral and the cardinal of Naples was merciless Friday in his condemnation of negligence by Italian officials. Johannesburg – Even the name given to Winnie Madikizela-Mandela at birth – Nomzamo, "one who undergoes trials" – foretold a life of struggle. During her nearly 38-year marriage to Nelson Mandela, she fought for black majority rule even as she vowed to escape the shadow of the great man. And although many South Africans called her the "Mother of the Nation," she would become engulfed in criminal convictions and scandals. JOHANNESBURG (AP) — Even the name given to Winnie Madikizela-Mandela at birth — Nomzamo, "one who undergoes trials" — foretold a life of struggle. JOHANNESBURG (AP) — Nelson Mandela's ex-wife Winnie Madikizela-Mandela, an anti-apartheid activist in her own right whose reputation was sullied by scandal, has died. She was 81. Madikizela-Mandela will be honored by a state funeral on April 14, preceded by an official memorial service on April 11, said President Cyril Ramaphosa after visiting her home in Johannesburg's Soweto township Monday evening. ATLANTA (AP) — At a funeral that began with the voice of Ray Charles singing "Georgia On My Mind" and ended with taps echoing through the ornate Georgia Capitol rotunda, former Gov. Zell Miller was celebrated Wednesday as a beloved leader who helped bring the state into a more modern era. Gov. Nathan Deal became emotional as he thanked Miller's family at the former U.S. senator and two-term Georgia governor's state funeral. The motorcade carrying former Gov. 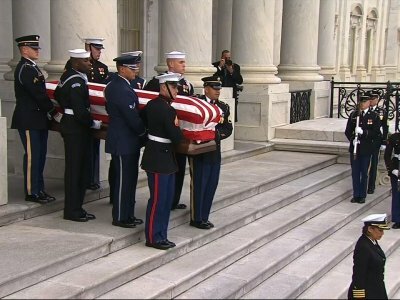 and U.S. Sen. Zell Miller's flag-draped casket has arrived at the Georgia Capitol where he will lie in state until a state funeral Wednesday. Republican and Democratic state lawmakers lined up in front of the Capitol to pay tribute as the casket arrived. Gov. Nathan Deal and his wife led the procession into the building as bagpipes played. A funeral service is to be held Tuesday in Atlanta for former Georgia governor and U.S. senator Zell Miller with three former presidents set to speak: George W. Bush, Bill Clinton and Jimmy Carter. ATLANTA (AP) — Funeral arrangements for former Georgia Gov. Zell Miller have been released and include opportunities for friends and family to bid farewell to Miller, who also served as a U.S. senator. A public memorial service will be held Monday in Young Harris, Georgia, where Miller died Friday at the age of 86. CHARLESTON - Richard Shank of Huntington is among eight new members appointed to the State Funeral for World War II Veterans West Virginia State Board of Directors. Shank is the Past Commandant for the Department of West Virginia, Marine Corps League. He joins Charles Baisden, Mara Boggs, Chuck Flannery, Luke Goodwin, Jean Lamb and Owen Stout on the board, according to a news release. They will serve under West Virginia State Chair Todd Morris. CHARLESTON — Richard Shank of Huntington is among eight new members appointed to the State Funeral for World War II Veterans West Virginia State Board of Directors. BUCHAREST, Romania (AP) — European royalty joined tens of thousands of Romanians who wept and applauded as they said farewell to Romania's last monarch, King Michael, who was buried next to his wife Saturday after a state funeral. Michael, who ruled Romania twice before being forced to abdicate by the communists in 1947, was remembered for his dignity and morality. He died at age 96 in Switzerland on Dec. 5. BUCHAREST, Romania (AP) — King Michael, who ruled Romania twice before being forced to abdicate by the communists in 1947, died at age 96 in Switzerland this month. 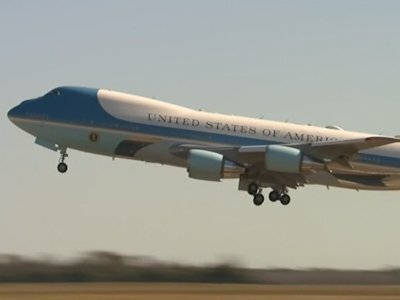 The late monarch's remains were flown by military plane to Romania this week and received with great fanfare. 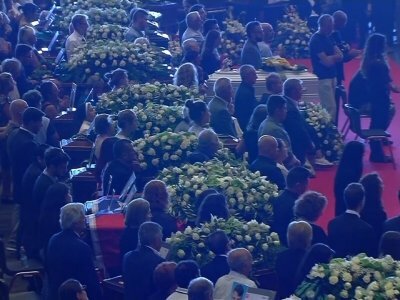 Romanian politicians, diplomats and tens of thousands of mourners have paid their respects at his coffin, first in the mountain resort where he was born and then at the Royal Palace in Bucharest. BEIRUT (AP) — Lebanon on Friday bid farewell in a state funeral to 10 of its soldiers who were captured and killed by the Islamic State group, amid a national day of mourning in honor of the servicemen. President Michel Aoun presided over the ceremony held at the Defense Ministry near Beirut, during which the soldiers were awarded Lebanon's highest posthumous medals. HARARE, Zimbabwe (AP) — Granted diplomatic immunity by South Africa, the wife of Zimbabwean President Robert Mugabe returned home from Johannesburg on Sunday despite calls that she be prosecuted for allegedly assaulting a young model at a luxury hotel there. KARACHI, Pakistan (AP) — Mourners on Saturday attended a state funeral for Ruth Pfau, a German physician and nun who earned international acclaim as "Pakistan's Mother Theresa" by devoting her life to the eradication of leprosy in the Muslim-majority nation. Pfau died on Aug. 10 at age 87 in the southern port city of Karachi. State-run television broadcast live footage of her casket being carried by a military guard at the city's St. Patrick's Cathedral. KARACHI, Pakistan (AP) — Ruth Pfau, a German physician and nun who devoted her life to the eradication of leprosy in Pakistan, has died at age 87. In a statement, the office of Pakistan Prime Minister Shahid Khaqan Abbasi announced a state funeral for Pfau, known as "Pakistan's Mother Teresa." Salwa Zainab, a spokeswoman at Pfau's office, said Friday a funeral service will be held Aug. 19 in Karachi, where Pfau died on Thursday.